A Disconnect - Economy, Corporate Earnings, Stock Market? A Disconnect Between Our Economy, Corporate Earnings, the Stock Market? It is hard to remember another time when there were so many different opinions regarding the future direction of the stock market. The “bulls” often support their argument by pointing to corporate earnings strength and falling unemployment while the “bears” commonly cite the slow pace of economic growth and a stock market that is at, or near, all-time highs. The first chart compares US Total Market Capitalization to Gross Domestic Product (TMC/GDP) and will increase when stock prices increase at a faster rate than the economic output of our economy. The ratio has grown dramatically since 2009 and is fast approaching levels not seen since the dot-com bust of 2000. 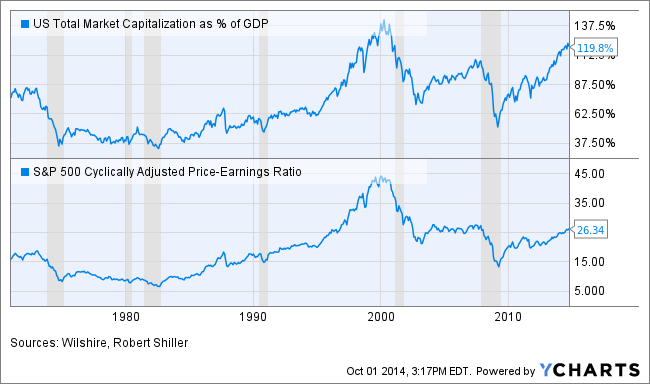 The second graph is a cyclically adjusted price-to-earnings ratio of the S&P 500 index (also known as the CAPE or Shiller P/E) which smooth’s earnings figures by averaging the past 10 years of corporate earnings data. 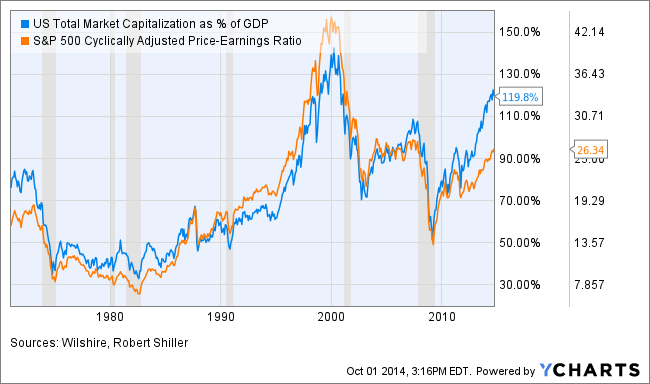 It is a measure of stock prices relative to corporate earnings (reported on per share basis). This too, has risen quickly and is close to levels last achieved in the run up to the financial crisis of 2008/9. Noticing the difference in trajectory between the TMC/GDP and the Shiller P/E over the past few years, we contend that current stock prices are more overvalued in light of overall economic activity than in relation to corporate earnings. Historically low interest rates the past 5 years have prompted companies to refinance their debt, thereby reducing costs. Doing so has artificially boosted corporate earnings because a dollar saved is a dollar earned, whereas revenue generated from operations does not garner the same 1-to-1 payback due to cost of goods sold. Lower cost of capital along with other corporate cost cutting measures taken in response to the credit crisis have contributed to record levels of corporate cash, earnings and subsequently the lofty market valuations. All despite a relatively challenging economic environment for businesses to operate under the past several years. Lower interest rates have created “cheap money” and spurred a spate of corporate bond issuances to finance a significant increase in corporate stock buy-back programs, resulting in a greatly reduced number of shares outstanding in the marketplace. Finally, the share buy-back activity could also help explain the frustratingly slow pace of our current economic recovery. The capital to buy those shares normally would be utilized for more traditional business purposes; to grow ones company through the hiring of new employees and/or building new plants and equipment, thus stimulating overall economic growth. Going forward we believe that if economic activity doesn’t increase significantly and justify current stock prices, then it is reasonable to assume a stock market correction will ensue to bring valuations back in-line with historical averages. 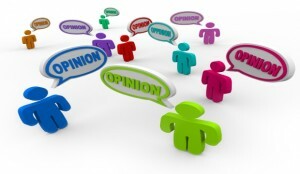 The wild card and immediate threat to the prospects for faster growth are interest rates. If interest rates soon begin to rise, that could stymie overall economic activity and increasingly hurt corporations because their opportunity for incremental earnings improvements (that they have enjoyed for the past 5 years) through debt refinancing will evaporate. Whatever comes to pass these are interesting and historic times for our economy and stock market. Article written by Kenyon Lederer and Jack Zboralske, Investment Adviser Representatives at Pinnacle Asset Management, Inc.
To learn more about Kenyon Lederer, view his Paladin Registry profile.